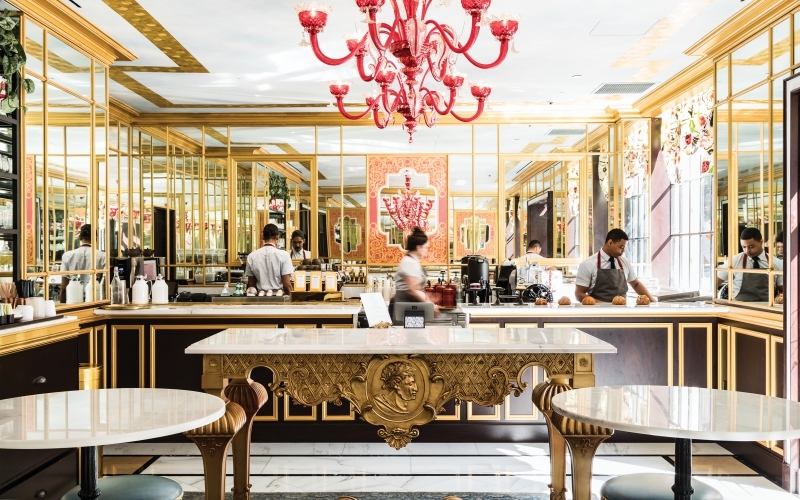 Walk into DTLA’s new NoMad hotel inside the restored 1920s Giannini building, and you’re greeted by a soaring Italianate covered ceiling propped up by gold-trimmed columns, two-story windows spilling soft light across marble floors, and enough velvet to drape a city block. You’ll also find two restaurants and three bars operated by a squad of James Beard Award winners. Chef Daniel Humm and restaurateur Will Guidara, who co-own Manhattan’s Eleven Madison Park (which landed atop the World’s 50 Best Restaurants list in 2017), oversee both the Lobby and the Mezzanine restaurants while Leo Robitschek, whose NoMad Bar in New York ranks No. 3 on the World’s 50 Best Bars, oversees the extensive cocktail program. The result is like Willy Wonka’s factory for adults. Here’s an all-in-one-day tour of the highlights. Each Morning, executive pastry chef Mark Welker and his team line the counter of the Coffee Bar with eight varieties of everyone’s favorite flaky French pastry, from sweet riffs filled with cappuccino cream to a haute ham and cheese “on rye,” which folds Rolf Beeler Gruyère, prosciutto cotto, and a smudge of Dijon into caraway-topped croissant dough. The glowing, sunlit room is kitted out with red Murano glass chandeliers, mirrored walls, and a small quarry’s worth of marble tables. 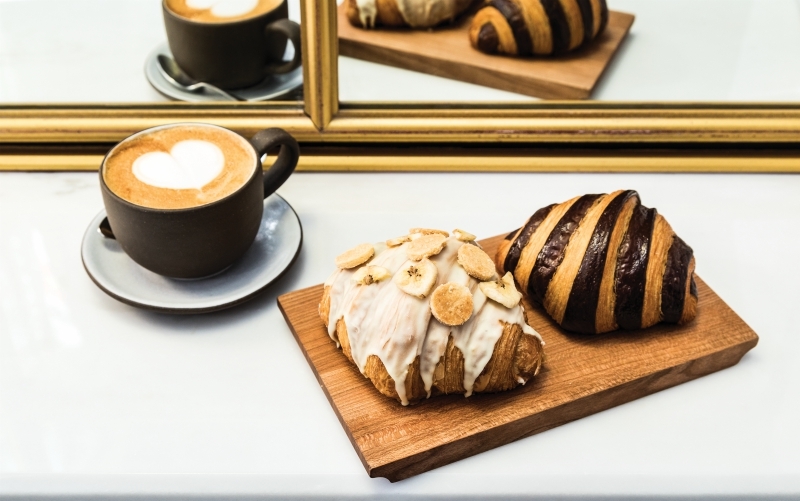 If there is a more chic way to consume butter and flour in this town, we aren’t aware of it. When the nomad opened in New York, Humm’s menu took inspiration from the Big Apple (think: a riff on steak tartare made from carrots). Naturally he did the same in L.A., looking to local history and terroir to build his culinary offerings. Consider the Cobb salad, which was invented at Hollywood’s Brown Derby restaurant in the 1930s. 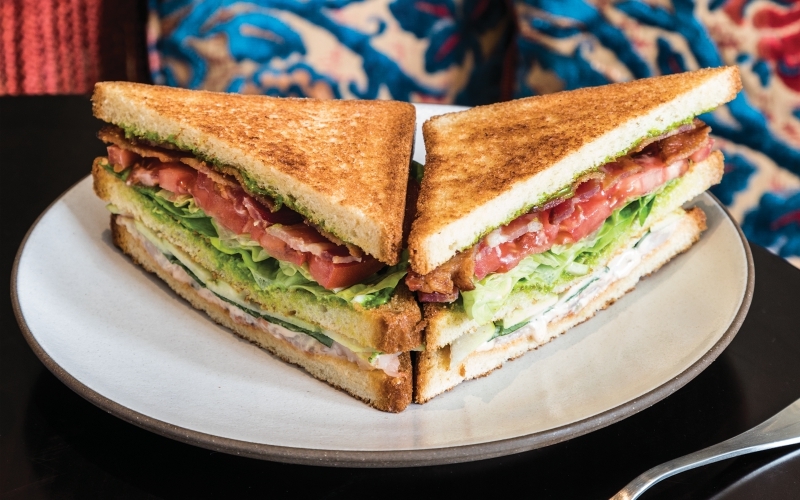 In Humm’s hands, it becomes a delicately plated mosaic of lettuce, avocado, and egg, with ruby-red smoked tuna subbing for bacon. The club sandwich is stacked not with turkey but blue prawns, Bibb lettuce, and, of course, avocado. Did we mention you’re eating under the gaze of a taxidermied peacock? Don’t expect a full tea service with crumpets, but do stake your claim to a couch in the Lobby and ask about the reserve teas, like the Malawi Antlers White Tea, which tastes of peach and apricot. Much of the selection comes from Sebastian Beckwith, whose company, In Pursuit of Tea, supplies Michelin-starred restaurants around the world. 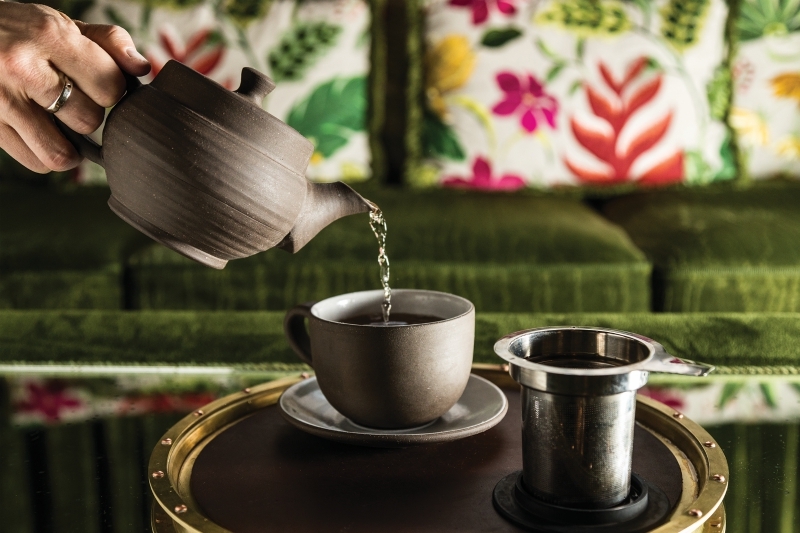 The NoMad L.A. is the only place on the West Coast where you can sip Beckwith’s funky expressions of oolong or try a limited run of upmarket pu-erh aged in a bamboo stalk. With a trio of bars and more than 50 house cocktails, it’s tough to know where to begin drinking at the NoMad, but the dark wood Giannini Bar on the lobby’s edge is as good a place as any. Choose from a menu of NoMad classics as well as L.A. newbies like the El Rey, a variation on a piña colada, with tequila, lime, sherry, toasted coconut, and a syrup made from dehydrated local corn. 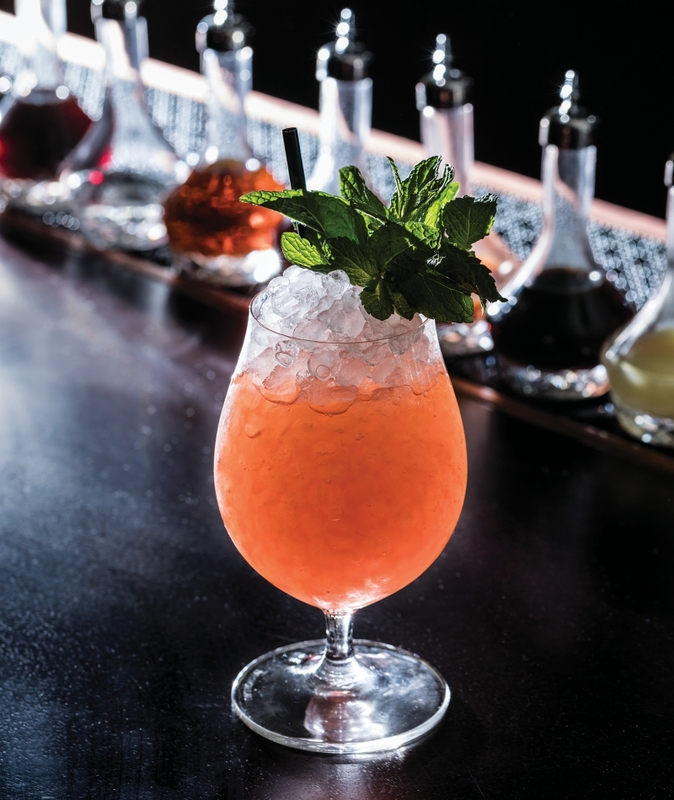 This clubby cocktail lounge is also home to “Cocktail Explosions,” Robitschek’s large-format drinks that serve up to eight from an oversize glass vessel outfitted with a spigot. For an evening pick-me-up, venture over to the Coffee Bar, which each day after 5 p.m. features several low-alcohol cocktails specific to the Venice-inspired room. There’s a handful of cafè-influenced aperitivos, like Robitschek’s caffeinated spritz that mixes coffee-infused vermouth with amaro and tonic for a buzzy start to the night. Eating upstairs? You’ll want to make time for a drink at the cozy eight-seat Mezzanine Bar, where reserve cocktails are made using rare and vintage spirits. A fine start is the Jungle Bird, a rum-soaked tiki classic balanced with Campari from the 1960s. 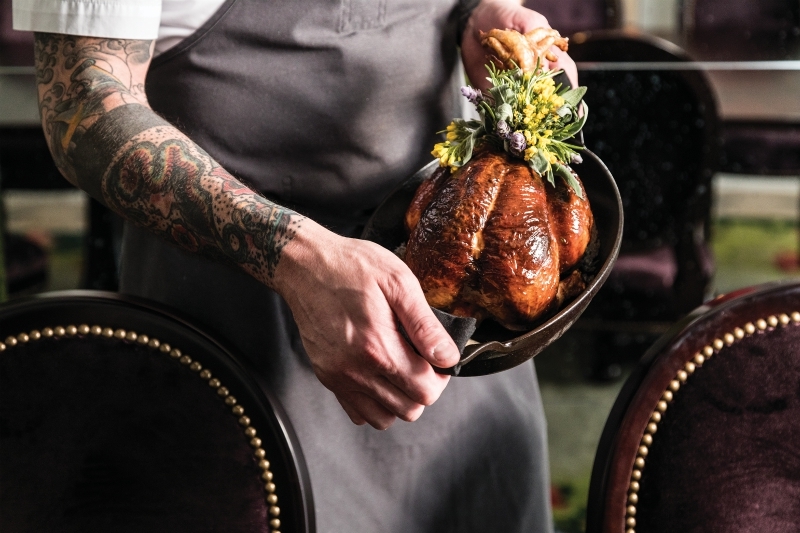 When you step onto the luxuriant Mezzanine, you’ll likely be enticed by “the chicken,” a $98 bird piped with black truffle, brioche, and foie gras stuffing. It’s roasted to a golden brown and presented table-side like a doctor would announce a newborn. Similarly dramatic, the baked Alaska dessert is doused with Jamaican rum and set aflame at the table; like the chicken, it’s meant to feed two. The theme at this upscale dining room is celebratory decadence (with prices to match), so put on your party shoes and maybe your stretchy pants as well.